Canadians in Portugal | For Canucks in Tugaville. When most people think of Portuguese food, they associate it with the typical Mediterranean diet - lots of fish, olive oil, legumes, salads and plenty of wine. They can usually identify one or two main dishes, typically codfish or sardines, and the emblematic “pastéis de nata”. However, Portuguese cuisine is a veritable smorgasbord of flavours and dishes that gratify the taste buds and congest the arteries. 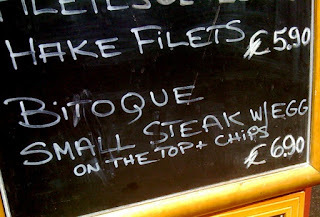 First off is the simple, unassuming “Bitoque”. This consists of either a beef or pork steak, fried in olive oil, lard or grilled and topped with a fried egg. It’s accompanied by white rice, some French fries, and a simple salad. This is the staple dish of taverns all over the country. Almost healthy if it were not for the French fries and fat based sauce the steak is swimming in. 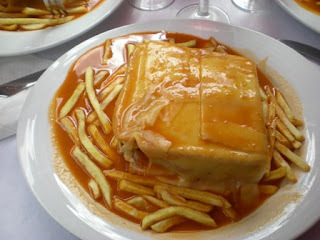 Next up is the “Francesinha”, a kind of heavy-duty sandwich, made the unhealthiest and yummiest way possible. Start with a slice of thick white bread, and then layer a fried pork steak on top, a slice or two of wet cured ham, linguiça, and then fresh sausage. This is topped off with another slice of thick bread, a fried egg, and a couple of slices of cheese. The “sandwich” is then put on a plate, surrounded by French fries, and covered in a spicy, thick, tomato and beer sauce, which causes the cheese to melt. Salad is never included, they don’t even attempt to trick you into thinking that this is remotely healthy. This is my personal favourite, and it’s unbeatable when paired with a hot summer evening, an ice-cold beer, a football match and good friends. “Alheira de Mirandela” is a sausage made from a combination of tasty animals, namely duck, chicken, rabbit or veal, and bread. No pork though, as this was a scrumptious way for the Jews to deceive the Portuguese Inquisition (no one ever expects the Portuguese Inquisition…). This sausage comes from the Mirandela region, and is practically the only thing of note to come from that region (just kidding).The sausage is either deep fried in oil or grilled over hot coals. Tradition dictates that it is served with boiled greens and potatoes, but as that combination was far too healthy, it is frequently served with French fries, white rice and topped with a fried egg. Sometimes a small salad is included to trick the health conscience. Lastly, you have “Leitão da Bairrada”, which is suckling pig roast over an open fire. It is seasoned using a garlic and pepper seed paste, giving it a distinctive flavour. 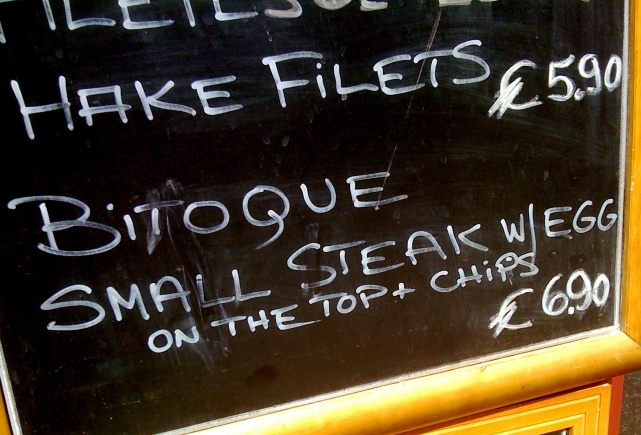 It is normally served with lettuce salad and orange slices, though many places also serve it with French fries. Surprisingly this is the only dish that does not managed to include a fried egg. All of the above should be served with either an ice-cold national beer or a chilled white wine from the “vinho verde” region. To top it off, some “ovos moles” from Aveiro, a caloric bomb whose explosive charge consists of egg yolk and sugar. It's the quintessential Portuguese "dessert", because it contains the two most common ingredients in Portuguese sweets (egg yolk and sugar), but does away with all the unnecessary fluff, like looking tasty. Portuguese Food is very good, one of the best in the world, specially the northern food, dishes like Arroz Cabidela (rice with chicken blood and chicken), rojões à minhota with papas sarrabulho, posta à mirandesa, tripas à moda do porto, bucho recheado, arroz de sarrabulho, lombo de porco assado no forno, pernil de porco, etc. ect many mouth watering dishes. Yes, this is all making me too hungry! To wash all this down though, besides the national beers and the vinho verde, lets not forget that many of these meats are better chased down with quality Portuguese red wine: Douro, Alentejo, Dão - you name it. Portuguese has great reds. That could be another blog entry all together though just like a good ol'fashion debate on the culinary delights of the egg in Portuguese cooking could equally be. "My Dear Month of August"